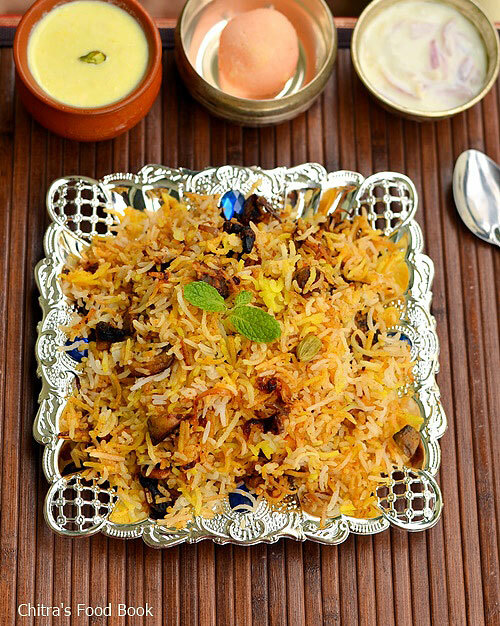 I tried Pakistani style biryani recipe for the first time on account of Ramzan festival.I hope all my Muslim friends and readers had a great Ramadan celebration by relishing chicken & mutton biryani feast .Actually I had planned to make this post on Ramzan day but I couldn’t do it as I had an unexpected guest at home for lunch.So I made this biryani yesterday to share it here.I have tried and shared many non-veg biryani recipes replacing chicken or mutton with soya chunks/meal maker,potato and other vegetables.Its been years since i shared mushroom recipes in my blog.So I took this as a chance and tried Pakistan Chicken biryani using mushrooms.I referred this recipe and made it..It came out really well.I loved it to the core.The procedure and the masala used in this biryani is very similar to Hyderabad DUM biryani but with a small twist.Just scroll through the ingredients list to see it.It would be unique & interesting . Please check my other Sunday Lunch Recipes Series recipes here. 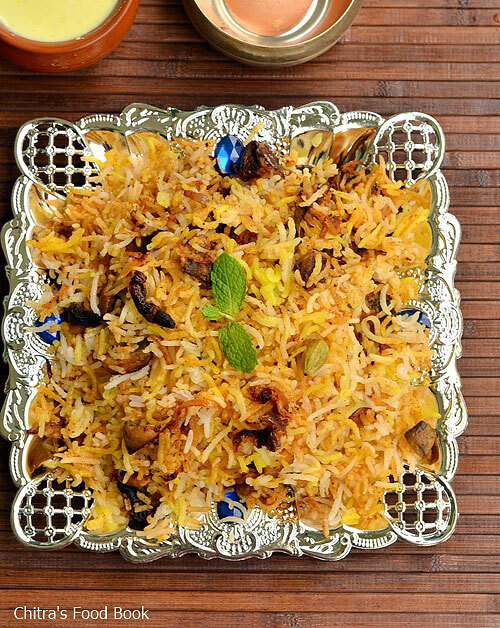 Wash and soak the basmati rice for 30 minutes.Cook the rice in 6 cups of water adding whole garam masala,a drop of oil and salt.Remove the rice when it is cooked 3/4 th.Keep in a plate and let it cool. Wash and clean the mushroom.Please check this link for cleaning procedure.Chop into cubes.Marinate the mushrooms using all the ingredients given under”to marinate”. Mix well and set aside for 30 minutes.Slice the big onion and fry using 3 tbsp of oil in a kadai.Remove when it is roasted well.Add few onions to the marination mixture and keep the remaining aside in a plate. For the gravy,use the onion roasted oil. Saute the whole garam masala and onion.Add g&g paste and mix till raw smell leaves.Lastly add the tomato and saute until mushy.Add the red chilli,dhania,garam masala powder.Mix well.Add the marinated mushroom mixture and add a cup of water.Let it boil till mushroom cooks well. 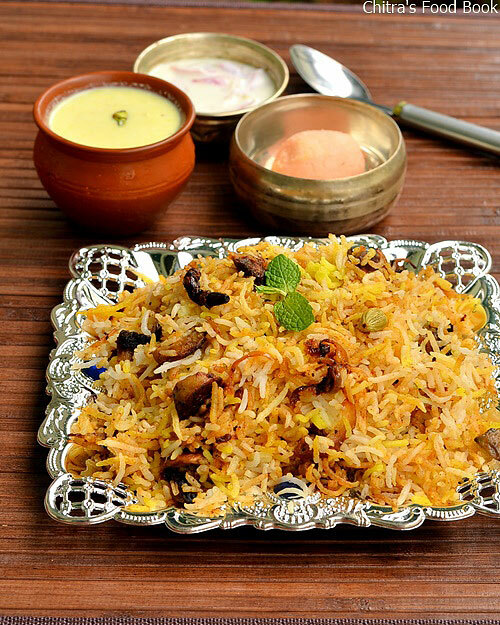 After the mushroom cooked well,boil the mixture till gravy becomes thick.Make sure there is very less water in the gravy.Now spread the cooked basmati rice and sprinkle the roasted onions,soaked saffron milk and chopped mint+coriander leaves. Add a tbsp of oil. around the sides of kadai.Close the kadai with the lid tightly and simmer the flame completely.Let it be under DUM for 15 minutes till u get a nice masala smell. Remove the lid and fluff the rice with a fork. Serve hot with raita ! Adding papaya paste gives a nice flavor. You can also replace garam masala powder with biryani masala powder. 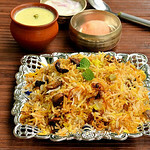 Try this Pakistani style biryani for a change.U will love it. Pakka class and Mass pics...Veery tempting plate,one quick question,u were added pappaya paste in marination...it is raw pappaya or fruit? Lovely n tempting presentation, but for non veg they use raw pappy paste I think so am i right Chitra. Its Ramadan not Ramzan. Plz try not to use wrong wordings especially on such common festival names. After reading your comment,i just browsed through few sites for correct wording.Please check this link : http://www.quora.com/Which-is-the-correct-word-Ramadan-or-Ramzan-If-Ramadan-is-correct-then-why-is-it-not-pronounced-as-written . As per this discussion,both are correct i feel :) Thanks for your suggestion. Can I skip the fruit paste for marination.. ? I don't have it.. Yes, you can skip it. Hi. I am in America. What is "curd"? Thanks.